No short available at this time. 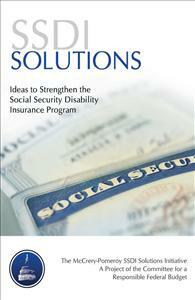 Formed in September 2014 and co-chaired by former Congressmen Jim McCrery and Earl Pomeroy, the McCrery-Pomeroy SSDI Solutions Initiative is a project of the non-partisan Committee for a Responsible Federal Budget dedicated to identifying practical policy changes to improve the Social Security Disability Insurance (SSDI) program. These solutions are meant to help spur and contribute to a debate on how to ensure the SSDI program best serves those with disabilities, those who pay into the program, and the economy. This book is the resulting collection of solutions, recommendations, and contextual chapters that illustrate the problems ailing the program.